Continue reading if you want to know the amazing features of this fishing reel. These reels are built and designed by fishermen for fishermen. While the other fishing reel manufacturers depend on a farm out design work, Pinnacle reels depend mainly on in-house designing. The product managers and engineers of these fishing reels are seasoned fishermen. Thus, they know the real problems faced by an angler and they develop their fishing reels by addressing all these problems. They also listen to the comments of customers carefully and make changes accordingly. The high-quality Pinnacle reels are the result of this continuous improvement process. Here is an analysis of the features and benefits of Pinnacle reels. 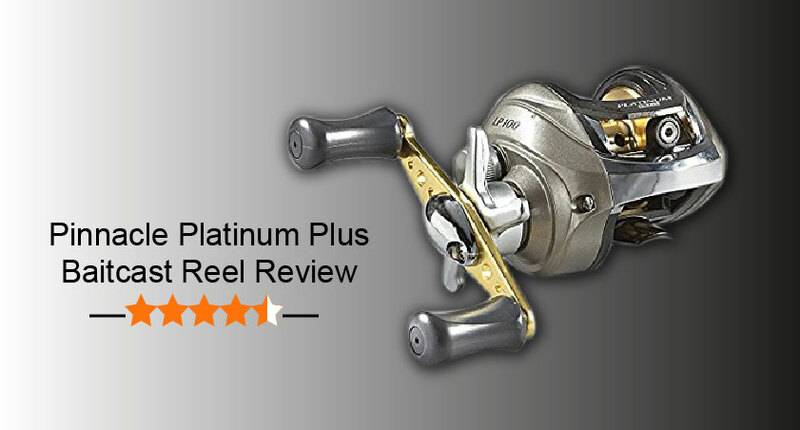 Platinum Plus is an amazing fishing reel from the stable of Pinnacle. It comes with 6 stainless steel ball bearings with iron out snags. Easy casting is the other major feature of this baitcasting reel. It has a fully adjustable magnetic cast control, which offers longer casts and higher initial speed. Therefore, you can avoid moving your boat around too much. High-speed gear ratio (6.2:1) reinforced graphite frame, unlimited anti-reverse, 120yds line capacity, audible click star drag, quick-access removable side cover, etc are the other peculiar features of this fishing reel. The wait this reel is just 7.8 ounce. Machined aluminum spool is the other important feature. The price point of this reel is really surprising. This is extremely affordable, and it is the best baitcasting reel for beginners. It has a lightweight magnetic frame and a fully adjustable 8 magnet braking system. Thus, it is ideal for competing with more expensive competitors. A large capacity aluminum spool is the other major feature of this reel. It can provide you silky smooth action because it features 6 ball bearings. The unlimited anti-reverse mechanism of this reel is helpful for preventing wind knots and slack line by eliminating backward movement or play on the crank. The 6.2:1 gear ratio is helpful for providing the speed you require to reel in the big one. This high-quality reel is useful for both beginners and seasoned experts. The fishing reels of Pinnacle come equipped with QuickFlip Button, which is located on the right side of the frame. This ergonomically designed button is present in all Optimum model bait casters. The easy-of-use and accessibility of this button help anglers to engage the gear without turning the handle. Thus, the bite can be detected instantly. Thus, the chance of missed fish will be very less. It is also helpful for getting more solid hook-sets. The TCC (Tandem Cast Control) combines the best properties of centrifugal and magnetic braking systems, which is helpful for maximizing casting distance and eliminating backlash. The users can adjust the easy-to-use dial for getting the exact brake setting. The centrifugal system is extremely useful for controlling backlash. This feature is available with the Tournament Class Optimum reels. Duralumin, an aluminum alloy, can be seen in the driveshaft, drive gear, and worn gear. It is 20 percent stronger and 70 percent lighter than brass. Therefore, they offer increased durability, and strength. At the same time, it is helpful for minimizing the overall reel weight. Over-sized drag washers are used in some select Pinnacle reels. Trulon enhanced material is used for making these washers. This material is highly efficient in retaining the superior heat-dissipating and braking properties even under the strain or we conditions. Excellent abrasion resistance and coefficient of friction properties are the other benefits of Trulon drags. The Unlimited Anti-Reverse and 20-point SharpStop work to reduce rotor. The first one is used for handling backslap in baitcasting reels and the second one is used in spinning reels of Pinnacle. In the Unlimited Anti-Reverse, the rotor and handle turn only in forward direction, which is helpful for eliminating the backward movement or play. Thus, you can prevent wind knots and slack line. It is helpful for getting rock solid hook-sets. The users will also get a silky smooth retrieve. The gears of Pinnacle reels are individually machined from a top-quality brass bar. Thus, the reels provide smoothest possible operations and maximum strength. To ensure absolute precision, unsurpassed durability, and optimum feel, each gear is milled on hobbing machines. Die-cast aluminum alloy is used for making the gearbox and one-piece metal frame. Thus, it offers adequate rigidity of gearbox and metal frame. It is helpful for avoiding torquing or flex. It is helpful for maintaining perfect alignment of gears and other internal parts. The centrifugal brake system is the other great innovation of Pinnacle. The engineers of this company have taken proven technology and they made it even better. You can adjust the dial from zero to 6 depending on the casting situations. A high-speed gear ratio is the other peculiar feature of Pinnacle reels. You can make a super high-speed retrieve in all types of fishing conditions because of this feature. These are designed for providing plenty of fish fighting power. It is also helpful for making a smooth, consistent drag operation. Pinnacle Plus fishing reels are available in 4 different varieties such as spin, bait, big-water styles and ultralight. All of them come with distinct features and various different uses. Super 10 Drag system is the major peculiar feature of Pinnacle reels. These are also equipped with tandem cast control, quick access side plates, multi-stack drag system, triple-support main shaft, etc. Thus, you can access the spool very easily. You must have some practice for setting up and using the Pinnacle reel. Pinnacle has lots of different new reels. However, at the same time, each of them is different from one another. Pinnacle is efficient in constructing high-quality, high-speed reels. Platinum Plus is designed for mainstream anglers. Thus, they come with the same gear ratio that is offered by its siblings. Graphite reinforced construction is also same. The price is the major attraction of this fishing reel. The OEM experience of this reel makes it different from other reels of the company. To cater to the needs of the clients, they produce reels in every single class that too at a reasonable price. Thus, once you understand the price point and application of the reel you need, you can easily come up with the best solution. You may be a hobbyist or a highly experienced angler. Anyway, Pinnacle Platinum Plus is highly useful for all your fishing needs.